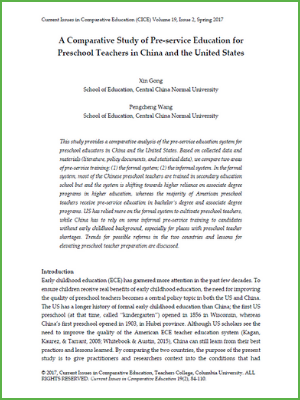 A Comparative Study of Pre-service Education for Preschool Teachers in China and the United States provides a comparative analysis of the pre-service education system for preschool educators in China and the United States. Based on collected data and materials (literature, policy documents, and statistical data). In the formal system, most of the Chinese preschool teachers are trained in secondary school, though the system is shifting toward a higher reliance on associate degree programs. On the other hand, the majority of preschool teachers in the United States receive pre-service education in bachelor’s degree and associate degree programs. The study examines how the United States has relied more on the formal system to train and prepare preschool teachers, while China has focused on informal pre-service training for candidates without an early childhood background. This study concludes with a discussion of trends for possible reforms in the two countries; it also includes lessons for elevating preschool teacher preparation.